Community Supported Agriculture (CSA) is a relationship between you and a local, family farm. You connect directly with a farmer, and every week, your farmer delivers a variety of fresh, nutritious food to convenient locations in your neighborhood. Connect with a farm through CSA, and you get to experience food in new ways - through seasonal eating, new and heirloom varieties, and new recipes and techniques provided by your farmer. You'll also get to know your farmer and become a part of the life of a farm through farm events, blogs, and newsletters. Your CSA membership or share is also an investment in your community and sustainable agriculture. CSAs are local, family farms, and the money you spend with your farmer stays in the community. PACSAC farmers grow your food without synthetic pesticides or herbicides, and becoming a CSA member provides support for your farmer's sustainable practices. We've gotten to know our farmers, Shari and her husband. Their friendship makes our experience more enjoyable. We want to support them. Shari always says it's important to hug your farmer! 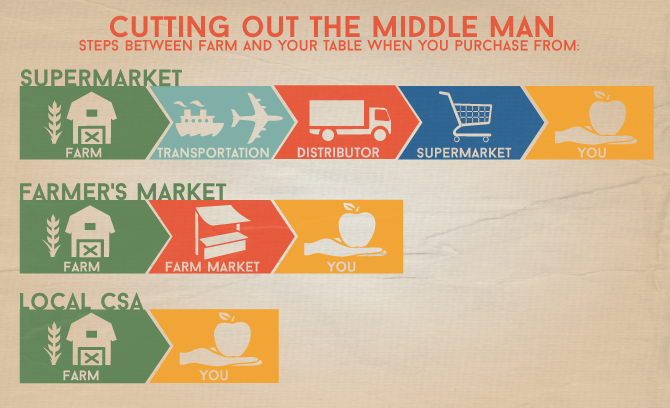 Graphic courtesy of Andrea Moore, from Farm to Table. CSA is great so where do you start? Search our directory to locate farms by pick-up location, special features, or payment options. Still deciding if CSA is right for you? Cooking – Chef skills are not required, but many vegetables require some preparation and time in the kitchen. Farms often provide recipes and suggestions, especially for items that might be unfamiliar. Eating more vegetables – If you already eat your vegetables or want to eat more vegetables, CSA will be a good fit. Trying new foods – Sorrel, kohlrabi, celeriac anyone? A great benefit of a CSA is the chance to try new vegetables and learn new ways to prepare more familiar vegetables. How do you choose your farm? Size of the weekly box – Share sizes range greatly. How much food will you eat? Do you want your share to include all of your vegetables for the week, or to act as a supplement to your regular grocery shopping. Length of season – From 18 weeks to 52, different farms offer different options for seasonal eating. A few distribute year round; some only operate during one or two seasons. Share distribution days, times and locations – Does the farm drop off shares at a place and time that is easy for you to get to on a weekly basis? If you're concerned about being able to make it to pick-up your share each week, you may want to explore farms that offer home delivery. Experience – Some farmers have more than twenty years of experience and some are just getting started. Supporting a new farm can be a rewarding experience, but all CSA memberships come with the risk that goes along with the unpredictable nature of farming. Add-ons – For additional cost, some farms offer eggs, meat, flowers, coffee, honey, ice cream or other items. Growing practices – All of our farmers are committed to sustainable growing practices, but some farms are also certified organic or biodynamic, and some raise livestock exclusively on pasture. The quality of our CSA produce just cannot compare to a grocery store. I'm always astounded by the flavor of the food in our share. It's so fresh! Have questions? You can email, call or visit CSAs farms. You can also ask to speak with existing CSA members to get a sense of what their experiences have been. Farms are busy places. Always contact a farm first before visiting. Weather, pests and disease can all have negative effects on farming, and as a CSA member you will share in some of the risks farmers face in their jobs. The diversity of CSA farms means that even if one crop fails, there is often something else that can take the place of that item in the share. In more than twenty years of CSA in the greater Portland area, only three farms have failed during the growing season. PACSAC cannot guarantee any farm or the amount of produce from CSA farms. We strive to educate about both the rewards and risks of CSA membership so that you can make informed decisions. Everyone should do CSA. Just try it. Once you do, you will love it.